Total – 53 items, 12.2 oz. 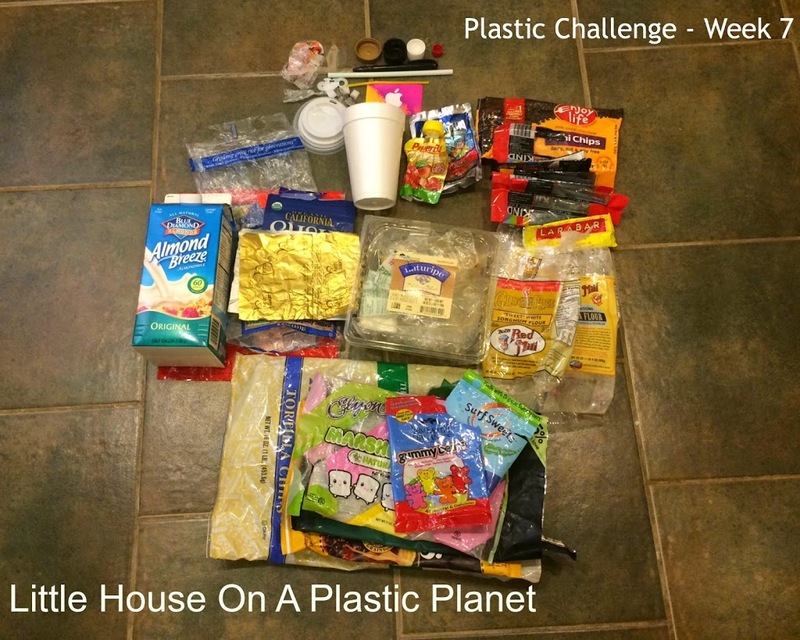 THIS CHALLENGE IS ABOUT NOT CONSUMING NEW PLASTIC. How would you handle the challenge of receiving of plastic gifts or gifts generously packaged in plastic? While secondhand plastic gifts would be more in line with our goals, the feelings of the giver must be considered. We don’t want to stifle the generosity and happiness of the gift giver. My children were kindly given gifts this week by loved ones that fell into this genre of consumption. A debate could ensue whether or not this plastic is consumed by our family or by the gift giver. I have chosen for the purpose of this project to include such plastic if it is new packaging and has no further reuse. This week 9 pieces of our consumed plastic resulted from the gifts we received. I’ve come to the realization that I have been addicted to Ziploc bags. They’re creeping out of every corner and crevice in the house. Boo! It’s me – the Ziploc bag! It has been over two years since I purchased a new box of bags and my two last boxes were made from recycled plastic. I have a weakness for organization and the Ziploc bag has been my best friend for many years for this purpose. I now must deal with the aftermath of my organization fetish – a plethora of Ziploc bags in the house that are nearing the end of their useful life. The bags have been washed and reused until holes present themselves. WHAT TO DO WITH THE RETIRED ZIPLOC BAGS? I’m beginning to go through them slowly and retire them week by week. Who knows how many I have accumulated between the four walls of our home. My freezer is still full of many more from pre-project foods. Any new food put into the freezer is being put into glass canning jars or other glass containers as opposed to plastic bags. Hopefully, by the end of this year plastic ziploc bags will be a thing of the past. They can be recycled along with other plastic bags at your local store with a plastic bag recycling program. Remember though, refuse, reduce and reuse come before recycle. We must reduce our consumption of these items. Recycling is not a perfect solution since pollutants are off gassed in the recycling process and they can only be down cycled rather than made into the same product again like aluminum can. We finished week 2 without buying any GF cookies & sweets. Now I have to work on chips! I made one batch of homemade tortilla chips from homemade tortillas this week. They were yummy – but its a trick to get them thin enough. Today we’re submitting our almost plastic free, bulk produce order from Azure Standard to be delivered next week: a case of: peaches, oranges, apples, and grapefruit. Sometimes they don’t even have produce stickers on them. I haven’t been able to order potatoes or onions plastic free yet. I don’t have ideal storage conditions yet for ordering those items by the case. Begin tracking how long a standard 13 gallon kitchen garbage bag lasts in our home before going to the landfill. Source local honey in my own refillable jars. Make another batch baby wipe solution. I CHALLENGE YOU THIS WEEK TO THINK OUTSIDE OF THE PLASTIC BOX!